Hi everyone, Jo Firth-Young here, joining you this evening with a post about creating a masterboard with Gelli®* plate printing and stickers. I love creating masterboards (they're so useful!) and I'm enjoying using my Gelli® plate so I thought I'd combine the two. I had fun with this - I'm pleased that I have a 'group' of items at the end. I created my masterboard on a sheet of labels (I purchased a pack of 8 sheets for under £2.00 at my local stationers) - the sheets contains 8 labels. I attached the sheet to desk with masking tape - this creates an added bonus (more about that later). I find the sheets of stickers needs to be stuck down because the pressure/suction of lifting the Gelli® plate can pull stickers off their backing. Gelli® printing works well on stickers because the paint is printed not painted onto the surface - so is dryer which means the labels don't get too wet and lose their stability and stickiness. Step Two: Here are the Fresco Finish colours I used for the masterboard. These are some of my favourite colours and I find work really nicely together - they're on the fresh side of pastel. To create the masterboard I printed using a 3x5 in Gelli® plate - but you can print using other sizes (though I would avoid a very large plate as you need a certain amount of printed detail) - a circle plate would produce interesting patterns. When I'm printing a masterboard or page of design I take the plate to the page, rather than the page to the plate, and I mount it onto an acrylic block to give it stability. Step Three: I started off with a layer of prints using Blue Oyster and bubble wrap (I really like the print that bubble wrap gives you - could get a similar effect with Ellen Vargo's EEV06 stamp set). I used prints of the bubble wrap pressed onto the Gelli® plate, prints of the bubble wrap itself and 2nd generation prints. Step Four: The next layer was created with Guacamole and the Crafter's Workshop Stianed Glass Doily stencil laid onto the Gelli® plate and then both pressed down onto the label sheet. With each impression I try to get each colour in different areas of the sheet, and go over the edges to avoid blocks of 'white space'. Step Five: Next up was a Sherbert layer - this time using big bubble wrap - again onto the Gelli® plate and printing from the bubbles directly. Step Six: I thought the sheet above looked 'cold' at this point, and so I warmed it up with a layer of brayered bubble wrap - this seemed to disguise the obvious lines of the Gelli prints and tie everything together. 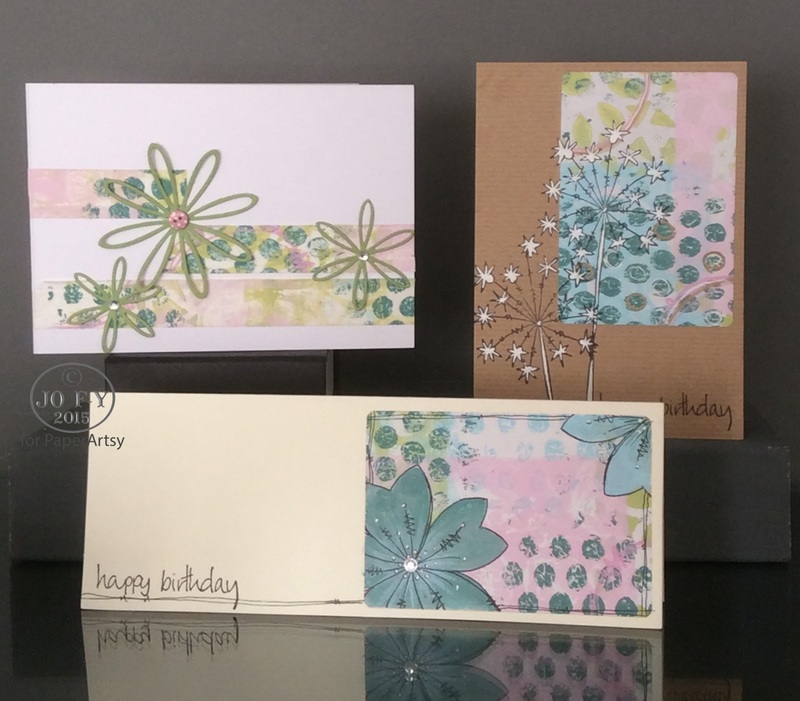 I love Dusty Teal paint - it's one of my favourite colours and as its no longer available I use it sparingly - Gelli print is great for that because a little bit of colour goes a long way. Step Seven: I am happy that you still see little areas of the original white sheet - looks lovely and fresh. And you can see I added some large Candy Floss Circles from JOFY31. Working with a sheet of labels means the "where do I cut it ?" decision has been made....you can just peel, stick, and use as required, directly onto card fronts!! ...over the sheet - unfortunately I don't have a photo of that but you can see the flowers on the cards and projects below - the flowers gave the board a feature motif. On some projects I painted them and others I left them as simple line image. 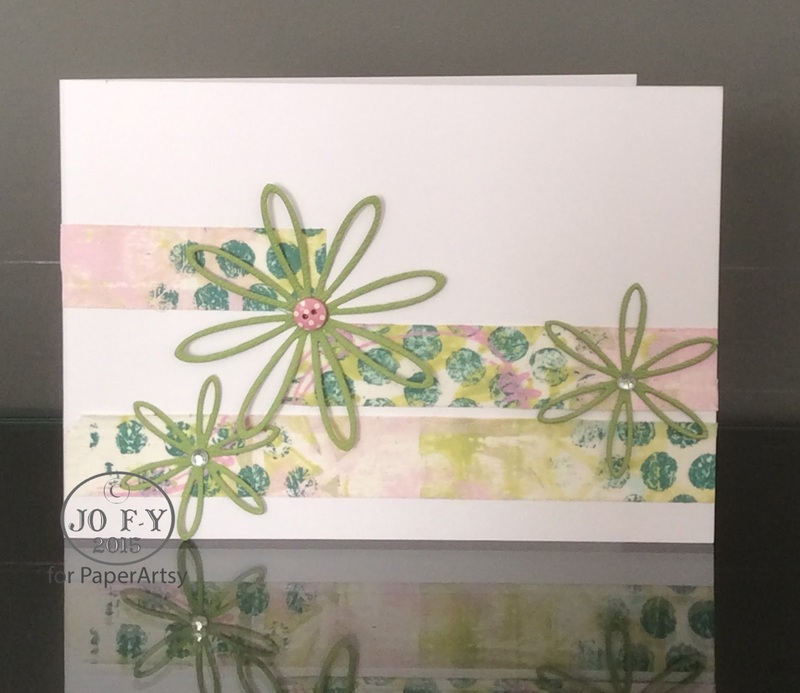 I'd like to show you more detail on a couple of the cards - first up is this simple card with bands of Gelli® printed tape - yes! This is the tape that held down the sheet of labels so it also became printed - seemed a shame to waste it! Too nice to throw away so I tore it into lengths and attached it to a 10x15cm card blank (NB because masking tape is designed to be low tack I added glue to back of the tape to ensure it remained adhered to the surface). On the card below I used 2 labels (spaced as they were on the main sheet). I painted the feature flowers, added a small die-cut 'doily' and sentiment - both those items help disguise the join between the two labels that were used on the card (10x15cm). I like this card because its not as 'less is more' than the other. Another project was a journal page, using a label and a length of the tape (I've smudged out the journaling words - hope you don't mind). The painted background of the page was created when I ran my brayer over the surface of the journal to clean the paint off. I didn't paint the flowers on this page because the line of my written words tied in nicely with the pen line of the stamped images. I hope you've enjoyed seeing my Gelli® printed masterboard and tape, and I hope it's inspired you to work on labels - it doesn't have to be an A4 sheet of labels as I've used here - you could use labels on rolls instead, and think or all the different sizes that label are available in - so many possibilities. Over on my blog this evening you'll find a post about the pros and cons I encountered while creating the framed panel shown in the photos above. Thanks for reading - and I look forward to seeing your creations! I learnt my love of masterboards from you, Jo and these are just magical. Love them!! Gorgeous masterboard - great idea to use a sticker sheet - and the finished projects are stunning. Oh wow, what a gorgeous master board and I love every one of the projects from it. I've been searching for stickers that size ever since I used up mine (only for boring address labels) but to no avail so far. Now I want some even more! That's a really great idea Jo and the labels are gorgeous. A really clever idea for creating cards and stuff too. Thanks for sharing some fab inspiration. PS: Need to hunt out some label sheets now! So many lovely card with this label. Love it. I love a practical idea and the sticker sheet will be fantastic for quick assembly of a card. The bonus tape is also great! Love the colours and prints. Great idea using labels and using the masking tape too! You've managed to use your finished board and tape in so many different projects...love it! Absolutely love how your projects turned out! Lots of inspiration, thank you! These are just gorgeous - and I love the accidental masterboard tape! Jo's masterboard using a sheet of labels is stunningly beautiful and so clever!! !